How Does School Choice Impact Our Neighbourhood Schools? As an educator and a parent of three year-olds, I often get asked the question, “where are you going to send your kids to school?”. This still tends to catch me by surprise and my response is always… “the one down the road”. This often leads to another series of questions like “you’re NOT sending them to _____?” or “really? you think that is a good school?”. Recently, I had a conversation with a colleague that lives nearby and when I responded with “the school right near our house”, she was so relieved as she said that, as a parent, she was feeling so much pressure to choose to drive her children to another school outside her neighbourhood and that by “just” having her children attend her neighbourhood school, she was doing them a disservice. These conversations lead me to ask, “when did we start thinking that schools in our own neighbourhoods were not ‘good enough’?” When did we think that going to school with kids in our neighbourhood was only an option if you could not (or do not) choose to go to another school? Choice is a form of power and I completely understand how parents want the power to choose what we feel is best for our children. I also know that we want our children engaged in school and when a specialized program across town can offer this, it because an enticing option. I am concerned, though, about our neighbourhood schools. I am concerned about our communities. What impact does school choice have on the health of our communities if some or many of the children and youth do not attend school there? If our children spend the majority of time outside of our communities, will they have as much pride and ownership over our communities? I don’t like to romanticize the past but I will for a moment. I grew up in a small town where we had only one option and that was to attend Coquihalla Elementary. Was it a great school? Absolutely. Were there issues there? Absolutely. The school was the hub of the neighbourhood. If there was an event, every kid in the community was involved and people took pride in the community. There was no statements said to my parents like “wow, you are just going to send him to that school?”. The best part of it all for me was that all my friends and every kid down the road went to school there. One thing I have heard people say to me is that “our neighbourhood school has so many troubled families and kids… I want my child to be in a less stressful environment.” I get that and I can respect that; however, these same troubled families and children are in our communities… they are OUR children too. At the far end of the spectrum, the impacts of decisions like this can be seen in many neighbourhoods in the US (and some in Canada) in which many people with money and access choose to drive their child to a different school… and the community school becomes a school with mostly families with high financial (and often other) stressors. This can lead (and has led) to a large inequity of educational programs and opportunities for students (just google the debate on charter schools and vouchers in the US). I understand there are situations in which a school cannot provide a child with the services he/she needs and the district and families can choose to transport the child to a different school to access more services. I also know that there are some children for whom the current structures and education system does not work. I can completely respect that as some students have a very difficult time experiencing success at school without options for extra services and more flexible environments. School choice and market theory in education seem to be a solution many districts are forced to provide. If they do not provide this, families can (and do) opt to leave the district and, on a large scale, can a significant impact on the financial well being of the district. The BC Ministry of Education promotes school options for parents but, to me, this seems like a slippery slope. In a recent conversation with admin colleagues from different schools, it was stated, “it’s like we have ended up competing with each other… and families seem to be always seeking a ‘better’ school to try.” To provide what some families want, many districts have created specialized schools and academies to try to attract students (and beat out other schools/districts in the competition for students). By doing this, neighbourhood schools often lose students and staff with strengths in certain areas. For example, if we have a school that specialized in music education, they will attract many students and teachers with strengths in music. How does this impact the music programs in other schools? How does this impact the music education of the students who cannot access the specialized school? If we have a school that specializes in trades and it attracts those with interests in trades, how does this impact the trades programs of our neighbourhood schools? There are some that state that providing school choice is a key strategy to better meet the needs of all learners as they can access more specialized programs and become more engaged as their education will be tied more to their interests. However, when we look beyond the surface, if not ALL students can be provided with this access, how does this impact our neighbourhood schools? Do our community schools become schools for those who do not choose other schools or for those who cannot access the programs at other schools? Can we do both? Can we have specialized programs in some schools AND maintain effective options for students within our neighbourhood schools? I am not blaming school districts for providing school choice as I think they have been forced to try to compete with each other for students and left with having to offer school choice as they try to service the needs of the families within their catchments (I cannot imagine the ongoing dilemmas faced by superintendents and boards of education). I also recognize that sometimes this competition has led to innovations within the schools and districts (although I would argue that if we spent more time collaborating than competing, innovation could be even higher). I also do not blame, nor do I have anything against, parents who choose other schools and try to provide the best education for their child. I do think, however, that we are on a path that is hard to stop and this worries me about the future of our neighbourhood schools. I realize some parents do a ton of research on schools; there are also some that make choices about schools based on test scores, rankings, neighbourhood incomes, school structures, and reputations without ever having set foot in the schools within our own neighbourhoods. School choice is everywhere in BC (apart from some rural districts) and North America so I am not trying to challenge every school district in the western world. My questions and concerns about school choice is a concern not about districts and people but about what long term impact this might have on our schools down the road. Once we have opened the gates to market theory in education and more and more school choice, academies, and specialized schools, how can we possibly go back? So if school choice is here to stay, then how do we work to provide effective opportunities in our neighbourhood schools so they are not just the default option? How do we provide equitable access to choice schools? Many families (and voters) want the ability to choose the best education for their child. School districts have a role to listen to their communities. But what long term effect does driving our children outside of their communities have on our neighbourhood schools and our communities as a whole? I have stated some of my opinions but I also wonder if I am being a traditionalist here? Will my views change in the coming years? Has this school choice bus already left the garage? Have we already moved beyond the idea of a “neighbourhood school”? Am I participating in school choice as I choose to send my kids to the school closest to where we live? Many of us commute to work and are often more connected to people outside of our communities (through work and social media)… so am I putting too much emphasis on community? 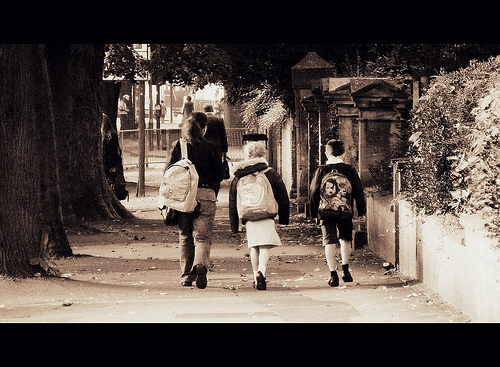 I don’t know the answer to these questions and I do not have children currently in the school system but I do know that, in a few years, I will proudly send my kids to the same school as our neighbour’s kids attended… the school down the road. Note: in my Master’s of Educational Leadership program at the University of British Columbia, we were always challenged and encouraged to reflect upon current trends in western education; market theory/school choice was one topic that was continually critiqued and discussed. For a more academic post I wrote in 2011 on school choice, click here. As a principal of a small “inner city” school I have a huge interest in the issue of school choice. As you said chris, the neighbourhood school is the hub of the community where we all have a common experience. Our school is proud to be that hub. On the other hand, I also believe that competition between schools breeds innovation, which we dearly need. Parents deserve the right to choose, and if they choose wisely, many will choose the school “up the street” if we share and show just how valuable that community connection can be. Good point, Kyle. The importance of sharing the positives of our schools can go a long way. I couldn’t agree more with the fact that choice is killing my enrollment at my school and subsequently the neighbourhood. My current K registration is 18, however 9-10 of those have chosen to go elsewhere. It looks as though I will be down another division in Sept. ’14 and have to surplus another great teacher. As an admin I work hard to build relationships, develop a strong teaching team and promote my school as one of the best I’m the City. At times it feels like a loss cause, however. Regardless, I still carry on. Hey Darren, I think the pre-K school choice is what is causing me to raise these questions. Part of me gets that at high school students may want to explore other options (although I still have concerns about equitable access) but I am wondering if we give our neighbourhood elementary schools a good chance before choosing otherwise? We are seeing a clear separation of classes based on housing prices but also based on access to other schools. Where are we heading? What happens next? Nobody seems to know the answers to this but hopefully we can discuss it and see if there is a way to keep our neighbourhood schools more equitable. How do we ensure equity in public schools and have school choice? When I had to register my son for kindergarten, I felt a lot of pressure to make the right decision. I too loved many things about coquihalla elementary, and one of the things I loved about hope was the sense of community. I went and visited our catchment school, which was a specialized traditional school. What I didn’t find when I visited was a sense of community. I instead enrolled my son in a school that I had to drive him to, same distance away, but he could not catch a bus. The reason I choose this school was the sense of community I felt when visiting the school. It was a much smaller school, which suited me, the larger elementary school, overwhelmed me when I visited, I could not imagine what my son would feel. The public school system did not end up working with our family, but we tried for four years. The best thing from attending the school we chose was the sense of community. I still feel a part of that community, and we have made many very good friendships, both the children, and us parents. So I do understand what you are meaning but I still think we can have a strong sense of community, even if we are not immediate neighbours. Hey Marcy, you bring up a good point that defines community in a different way… and how a school can create that community. You and I have had some good chats on programs and school choice and I am happy that things are starting to look better for your children. So my question for you is more about access. You have the means to access another school so this worked for you. Should districts have to provide access to those who cannot afford to attend a program at a different school or for a school of choice? If we believe that children in BC should have equitable access to education, then how do we provide access? If we are going to, it must come at a cost of losing something else… and thus the slippery slope. Choice is power and you are right, parents do know their children the best. In addition to impact on neighbourhood schools, my concern is what happens when only a portion of the population can actually choose. Yes this is a difficult question. I am very lucky in some ways in that I get to be a stay at home mom, as I can no longer work because of my disability. I think this is the first time, I have been happy that I am no longer able to work. I am not sure what our decisions would have been if we were still relying on my income. Unfortunately I think the outcome would have been my son not succeeding in school, as the school district was not able to provide what he needed to be successful in school. At first I felt a lot of anger and sadness that my children would not be able to enjoy the childhood I had going to a brick and mortar school, I felt like they were going to miss out. I was angry that the school district and the province of BC was not able to provide the services my son needed to attend school. My attitude soon changed, and I felt grateful; I felt grateful for the opportunity to school my children at home, grateful to be able to see first hand all their accomplishments, grateful that I had a disability preventing me to work, so I could homeschool. There are some parents that homeschool, and work fulltime, there are single parents working and homeschooling. I do not know how they manage it all but it can be done, but it is so much harder. So yes I am grateful, and I realize privileged. As for access to choice schools do I think access should be provided? I don’t know if that is even a possibility do we even know all of the reasons access would not be for all. Is it because parents don’t have a car, parents who have to be at work at a specific time, children whose parents are incapable of getting their children to school, what exactly are the reasons limiting the access. Do some parents feel that there is a two tiered system that they do not have access too? The parents at the so called inner city schools, are they there by choice or because they feel they have no choice? Are the children at these schools really getting a poorer education than if they were at a different school? How would you even measure that? Our catchment school was I think considered a choice school, as they had changed it to a traditional school, to draw enrollment in I believe. I decided to enrol in a small school, which I felt had more of a small community feel. I don’t think taking away the parents choice is the answer, but I think parents need to be more educated, and not biased in making a decision. I think a visit to the neighbourhood school is the first stop to see if this school would work for your family. I think the convenience of sending your children to the community school is a great thing. And I do think it is great for the children and the neighborhood. I think the answer to the question is not to take away choice but to ask more questions. What can we be doing differently, Why when schools receive the same funding formula, are some considered better than others? And what is considered better? Why are parents choosing other schools? Does it all come down to socioeconomic status? I truly believe if our choice was gone, my son would not have success at school. Just to give you more of an idea, my son was barely meeting expectations, and behind in many areas in school. He was referred for testing and it has come back as being gifted. So even though he is gifted he was not able to learn in the classroom. Maybe the best scenario would have been that all schools can meet all children’s needs. Unfortunately I don’t think this is possible but I think we are moving in this direction with differentiated learning. I am pleased that you are raising these questions Chris. As a parent, I see my children’s school (just down the road) now talking about a lottery system for in catchment Ks for September 2014 because density in the neighbourhood has grown faster than school planners anticipated (school was rebuilt within last 5 years) Parents of course are up in arms – especially when many cross boundary children attend the school as it has a unique philosophy (multiage and family groupings) that has drawn out of catchment families. Whoa- what a philosophical discussion we had with our eleven year olds at the dinner table tonight. Who should have the right to the spots? Catchment children or non? Should out of catchment children have to leave? We had no right answers to what is bound to be a big mess. And one that will impact our community. As a teacher, I experience the other extreme. I teach in a high poverty school that is experiencing declining enrolment. School choice has provided an option for parents who don’t want to send their children to an inner city school to choose other options in the District – including a nearby dual track school offering French Immersion. I see parents overwhelmed by choice, feeling anxious and guilty about making the right choices. I believe that we do need to accept all children in the community as “our children and our community” and feel that more innovation and equal access would be happening if less school choice were available. I don’t think you are being a traditionalist to put community first. I appreciate your questions. Thanks for your thoughts, Carrie – what a dinner table discussion! I guess maybe you have raised another issue… if there are concerns about a school… and they are real concerns (ie. structures, resources, personnel, etc), then does school choice do anything to fix the problem? What it does do is cause people with capital (ex. access) to move and those without have to stay. If the school structures and resources are in need of financial support, then what? Another reason that I have mentioned is people moving because of behaviours. Again, school choice does not solve the behaviours. The students who struggle need MORE support and often when students leave, the school is left with fewer resources and less support. As I said, I don’t blame parents for trying to choose what is best for their children but this ends up looking like a solution when it really does nothing to solve what is a possible concern in the first place. Rambling here… but you got me thinking! If students are looking to go elsewhere we have to look at why they don’t want to go to their neighbourhood school. There must be a reason. What can the school/district do to make it more desirable? I also believe that schools are better off focusing on doing fewer things well than many things mediocrely. Schools of choice are very powerful places with many passionate students, teachers and parents who create an amazing school community. I went to a school of choice and even students that didn’t live in the community were still involved in it in a positive way through the school. I understand the problems it can cause, but there are other ways communities come together. Most of us do not work in the communities we live in and we are still connected in a variety of ways. Hey Cheryl. I don’t disagree with what you have stated as yes, schools of choice can become great communities. Another angle that concerns me is that school choice is most often available to only those who have the money, transportation and cultural capital to be able to make this choice. A friend of mine struggles with finances. Her son saved up to attend the hockey academy at a nearby school like many of his friends did. Unfortunately, he fell a little short and did not have transportation so many of his buddies went to the school and he was left at his neighbourhood school. The struggle we have is to balance what is best for the few and what is best for the many. I am not sure I have any answers but I know there are many parents out there that, even in a system of choice, have no choice when it comes to schools. So there is the concern of the impact on neighbourhood schools and also the concern that if schools of choice are here to stay, how do we ensure equity in a public system? Choice in schools can be viewed as both positive and negative depending on ones perspective, and on how things are “rolled out”. Choice that fits with the needs of the neighbourhood can be win-win, especially if staff and the neighbourhood have the opportunity to make the choice together (not decreed from above). Part of my masters work was examining the motivators of parents who choose schools/programs of choice. I found that the motivators were not the same for each school/program of choice. Hey Janet, you raise a good point. If a neighbourhood wants to make their school a school of choice that better meets the needs of the community, is there an issue with that? That is an interesting concept and I think, for me, as long as the system is more equitable as a whole (ex. students have equitable access to choice schools)… it would at least be a place to start. I am wondering, though… does a neighbourhood school that decides to become a certain school have to become a school of choice? Or can it just become a school that better meets the needs of its community? As a teacher in a small inner-city school, school choice has had a huge impact on us. We struggle with the very conditions that you describe. Students whose parents have the wherewithal to send them to other schools follow the special programs, while students whose parents are less able, less wealthy etc. continue to send their children to us. The result has been that overtime, the programs we are able to offer has contracted. We simply do not have the numbers to provide a robust school calendar. While “regular” students in those “special” schools enjoy English Literature or Psychology because their schools have the numbers to support a broad range of classes, our students do not have those same options. There are not enough students to support both an English class and an English Literature class, if we offer Physics we must cut Biology, every year we have to decide whether to offer History OR Geography. Electives like auto, wood working, textiles become untenable because we have to create classes with students ranging from grades 9-12 in order to have enough students to sustain the class and justify the teacher time. What this means for us, in practical terms, is that scheduling is a nightmare, and good teachers don’t stay because they end up with 5 or 6 preps every year. But what it means for our students is worse. These students who are already disadvantaged in so many ways, are further disadvantaged by a school program that is not stunted and in many ways cannot meet their needs. If you think the numbers game only affects our ability to provide enriching academic and elective classes, you’re mistaken. It also limits the amount of assistance we can provide to our students with special needs – those with low literacy or numeracy skills, those who need more one-on-one time are severely under served, because again, our numbers do not support the kind of staffing our students need. I respect that parents want to do what is right for their children, and give them the best foundation for life, but as you so correctly stated, all the children in the community are OUR children. Can we support our neighbourhood schools so that ALL students get the best education available? Kim, you have shared yet another example of this slippery slope that ends up further hurting our already disadvantaged children. As a public body, we must have these conversations. I had a great conversation with a parent/teacher the other day and my question was, if parents have the right to choose the “best” situation for their children… who has the responsibility of striving for (and working to ensure) equitable learning conditions in schools? In the history of schools in BC, school choice is relatively new but I am afraid this ship has already sailed. So now what do we do? How do we work to create more equity and support for some of our most vulnerable students. We cannot put our heads in the sand as educators and pretend this is not happening. The example you shared is yet another reason we need to have this conversation. Thanks for commenting. For my wife and I we thought long and hard about where we wanted to move to. We decided on a community close to many joys we experienced growing up. They include trails, parks, community centers, playgrounds, a cul de sac, a backyard, and yes proximity to schools my kids could eventually walk to. For us it wasn’t one particular school that we looked for but one that gave us the comfort of knowing it was in a community we love and our children love and are proud of. Selling our home and buying a new home brought up many discussions between my wife and I related to school. Should they go to school with one of us in a different district? Should we find a home closer to the district my wife and I teach in? How close is it to their daycare? We always came back to the same romaticized view of community you did… we wanted our kids to feel connected to where they live and form meaningful bonds with people in their neighbourhood and take pride in the things that make this community so wonderful. This past January my wife registered our son at the school we can see from our bedroom window despite the outside pull that the school was “ok” but not the best in the community. How would I know? It bothers me that people base this solely on what is written in a real estate write up based on a standardized test that is widely panned by teachers & admin at all levels of schools in BC. It is such a microscopic view of what makes a great school or community. It puts the focus squarely on competition rather than community for people looking at schools for their child. These constructs are based on the outside imposing their perceptions on the school rather than the institution communicating their story outwards. Now I look forward to getting a glimpse of the learning experiences through their eyes and hopefully through the eyes of the educators at the school. Building community is about many things related to celebrating & connecting students’ learning to the world, and communicating this celebration to all stakeholders in the community through channels that reach the stakeholders where they are. I’m curious and hopeful about how the school will be the voice to the community about how great they are and how they celebrate those learning in the community. I would want them to be the stewards of this message rather than yielding that control to others. I want others to know the school’s story and be as proud of this school as my kids are of it and we are to live in its neighbourhood. Schools of Choice is an eroding force that peels away students from the neighborhood. It is a destructive initiative. Instead of stealing students from their ‘home’ schools, the government should be spreading the ‘attractive’ programs to more school buildings. Create opportunities instead of limiting them. These programs could encourage all students to strive to find passions and specialties, instead, once a student finds a program they would like, they are spirited away from their neighborhood in an elitist roundup of learners. My district won’t let me start an academy. (Even though I actually have a unique idea……and, no, soccer academies aren’t a unique idea.) Instead, I and the members of my school’s community watch our student population bleed off members as they flee to ‘schools of choice’. Our school is slowly drifting away while others congratulate themselves on acquiring my children (yes, I consider my students my kids) for their school. I am bitter about the issue. This erosion started years ago in my school. We are smaller and weaker for it. Before proceeding, care and caution should be taken. As is often the case in education and in life, I don’t think there is a clear black and white here – and I appreciate that you acknowledged that there are, indeed, reasons to carefully choose a different (non-neighborhood) school. I too believe in quality community schools, acting locally, and making sure EVERY child gets a chance to thrive (not just those kids who have families with flexibility, mobility and means). But I also know that for those of us with kids “outside the norm” (by a wide margin), the most important thing I look for (and recommend to others in similar situations) is to find a school that “speaks the same language” as you. By that, I mean that not every school/teacher has experience with every kind of student. And with the best of intentions and the most caring people in the world, not every teacher can ever understand/research and implement the strategies/pedagogies/supports/models that some kids NEED. Schools or programs of choice are sometimes the ways that we “focus” our energy, effort, training and supports to make sure the needs of particular kinds of learners (whose needs are not, and most often cannot be, met within a regular classroom) will find the environment they need to thrive. Particularly in times of budget shortfalls and extreme rates of change, we need to focus. Or else we’ll lose some kids. And losing kids just isn’t an acceptable option, in my opinion! So, definitely support your neighborhood schools! Act locally! Support community! AND be conscious and thoughtful about what kinds of supports/programs different kinds of kids need. Oh My! In my work as a guidance counsellor I have worked with hundreds of families. The amount of times I have heard this question and the craziness that occurs with parents around the grade 8 to 9 transition. I think the part that bothers me the most are the parents/students who apply for several special programs: I B, Arts School, Math and Science, and then usually remain in their French Immersion program. It is like ” I want to play the game that only the privileged get to play”. The French Immersion Secondary school has an excellent reputation. They are strong students and “those types of students”, can meet the requirements of all special programs. Yes, I think you are being a traditionalist. The idea of community is changing dramatically. My husband is a minister with the United Church of Canada. People church shop now, just like people school shop now. I expect your views will change in the coming years when you need to address which high school your children attend. I think we have already moved beyond the idea of the neighbourhood school. I guess my main concern is what message is school choice sending to children about learning? The idea that the school is responsible for my success and that if I go to the right school I will be successful. What a dangerous idea. I often asked students – How are you going to contribute to your own success and your school? I’m so torn on this issue. I too always said (I am a teacher who has taught mostly inner city in my 14 years) that I would send my own children to their catchment school. I want them to be able to ride their bikes to school, to have friends around the corner, etc. When my oldest was 3 (4 years ago), I still said that. I even had him at the preschool that was attached to his catchment school. His younger brother started at that school’s preschool too. Friends (non teachers) would say, but is that the best school? It didn’t matter to me. I knew where the best teachers were… inner city. When your seniority is high enough to go where you like, but you stay in inner city, it’s because it’s rewarding and you’re making a big difference. Now, my child’s catchment school is by no means inner city. My children go to school in a different district than the one in which I teach. So, my older son started kindergarten there at his catchment school. By Christmas, I couldn’t take it anymore. He started at our nearby traditional school in January. Things in his classroom, were out of control. He went from being wonderful in preschool (for 3 years) to get into trouble and I helped out in that class ( I was job-sharing ). There was a combination of a lack of classroom management and great deal of behaviour problems in that classroom. It was not unusual to see kids play wrestling on the carpet and nothing being done about it. Unless I was there which wasn’t often because I couldn’t bear to watch the unraveling. Did my son engage in that fun. Yes. It was seen as ‘okay’ by him because no one was stopping them. It got me to thinking about my own classrooms over the years in inner city. The high amount of needs (particularly behavioural) and the lack of support (not from admin but from the ‘system’) and subsequently the government ripping away so much that had been done to fix these issues and things getting worse again. It got me to thinking how no matter how well I taught and engaged and planned and adapted there were always kids in my class who I felt sorry for and who I felt could be doing so much more and not being held back by these ‘other kids’ (who I loved) if only they could go to a regular school. Is a lot of it dictated by the socio-economic area? Absolutely. Before my own children were in the system, I too, felt, and still feel that choice schools will further separate classes, schools abilities to achieve on a fair level, and create more problems. But at that moment, as a parent, I knew that my son’s kindergarten year was the base for all the rest of his schooling. This was the year he would learn what is acceptable behaviour and what was not. All the work the preschool teacher had done with those kids was being undone right before my eyes. Lack of consistency, lack of consequences for behaviour, and a very very very unfairly distributed class (a full weighted split with about three boys to every one girl). Was it an inner city school? No. Was the whole school like that? No? Could I request my child be put in another class? No, I know it doesn’t work like that, and I’m a teacher, so I have to watch my step (including not using my real name on here) so that I am not talking badly about another teacher. He started at the new school in January that year, and I’ve never looked back. It was the best decision I ever made for my child. He is thriving. He is not getting into trouble with other kids. Behaviour that was going on in that classroom simply isn’t tolerated, and to be honest, a lot of the kids that behave like that, just are not at that school. The kids at this school are taken there by parents who value behaviour, manners, a love of learning, and care about their education. It’s a public school, and there are no entrance exams or application forms. It’s just a bunch of parents driving their kids to a place where they feel their child will get a fair chance to do the best they can. I am so glad I had that choice for my child. I’m also glad that he started preschool at his catchment school because he still has friends in the neighbourhood with whom he can play. I was in a district that had two (public) high schools. Rather than just being neighbourhood schools, they became schools of choice. The one school had a great industrial arts lab and the other had a great drama program. Rather than competing in these two areas, the schools decided to focus on what they did best and the students chose between them both. In that sense they were schools of choice; however, most students still went to the school closest to them. That allowed the district to still offer both programs and really develop them while offering choice to parents. Choice or neighbourhood schools should not be an either or but a both and. My husband and I are both educators with one child in the system and one child about the same age as Chris’. We had similar questions before deciding to place our child in the neighborhood school. The look of pity that we sometimes got from people for not making a “better” decision made us angry. Far too often, conversation with those that gave us the look of pity revealed that their reasons for choosing a school were racial or class based. The actual programs being offered were secondary. Additionally, as other educators here have mentioned, we run the risk of residualizing high poverty schools. Anyone who has worked in a school in a high poverty area has likely seen this happen. We have never regretted our decision to have our daughter attend our neighbourhood school. We believe that it would be quite rare that a student is unable to have success in a neighbourhood school, and we wonder if people are too quick to make changes at the first sign of difficulty these days. This attitude can be seen in the divorce rate, and the number of times people change careers. Maybe this is a little traditional, but perhaps we need to work with people in our community even when it means we will face some adversity. Maybe this would be better than the quick fix. We believe that this would only make our community and ourselves stronger. Thanks for writing this post, we really can relate to what you are going through and wish you the best of luck. This is certainly an interesting question. I am glad you posed your questions. One thing that we may not be paying much attention to is related to this. In our quest for preparing our children for a “global economy” we are forgetting that regardless of where they live, they will still have a community. No matter where they live, the choices and actions of others close by them will make an impact. We teach them to focus so much on the whole world, that we don’t focus on being good neighbors or “kind and caring friends” as my kindergarten teachers love to say. There is an erosion of community in general, and school choice is one of the many symptoms (causes?) of that. Chris…this topic has been on my mind quite a bit recently and you’ve clearly articulated many of my concerns. We take for granted that “choice” is always a good thing – but is it? Obviously, I want more than one kind of tv or computer to choose from. I also like having options when eating out. But what impact does choice have when it comes to education? Maybe our definition of “community” is evolving and perhaps I too am a traditionalist in that I’m concerned about what “community” is evolving into. My current worry is that when a school experiences an “issue” it is often easier for families to move to another school rather than come together as a community to work at making things better. I wonder about the long-term effects of this behaviour. Are we becoming more individualistic as a society? I think you’re right that school choice is a barn door that’s going to be almost impossible to shut now that it’s open – so – at the very least I think we need to shed as much light on it as possible. People need to not only see some of the positives, but the negatives as well and engage in an ongoing dialogue about how we come together as an educational community to make things better. Thanks for bringing this up!! It doesn’t surprise me that BC has school choice – it is desired for personal advantage. So when the public is asked whether or not they like it, perhaps through the bcedplan consultations, of course individuals answer in the affirmative. That doesn’t mean that it is a good idea. It means that some people (probably incorrectly) think it will help them. I’m not sure what justification is used to offer school choice, as it does not appear to be in the best interest of the public in general. And we are talking about public education. No question, school choice leads to ghettoization. I see it in schools not far from where we live. Not good. For our own family, I can’t help but say how happy we are that our kids can walk to school, walk to school with their friends, and keep our community together. Within 2 blocks of our house there are 4 families who kids get bussed to a federal school. While these families have kids the same age as ours, there is virtually no interaction between them and the rest of the kids in the neighbourhood. 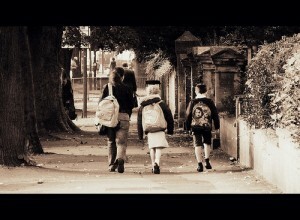 Kids tend to hang out with their school friends. It’s too bad this happens, and highlights just one problem with school choice. Another comment about choice is when families speak about it in terms of “good” school or “better” school. If someone doesn’t think their local school is good, what does this say about how they feel about their neighbours? Having said all of this, choice does seem to offer some legitimate and important service. For example, the families I mention above send their kids to a Francophone school. Culturally and linguistically this is a great opportunity for them. Another example would be if a student has a strong interest in a subject such as robotics, which is only offered at a few schools. Where things get really tricky is as you mention, what do we do with it now that we have it? Do we enter into arms races to attract kids? Is this competition actually good? I think it’s great that schools are offering more interesting programs to attract kids, but I’d like to think that schools should offer the most interesting programs possible, regardless of enrollment problems and incentives. And facing another year of funding cuts, the ability of schools to offer programs and courses that don’t fill up will keep getting more difficult. I’ve taught at two “choice” schools and one continuation school. The first was in Lakewood, CA (Mayfair High) extremely diverse almost a 30-30-20-20 mix. Many of our students bused themselves in from Compton/Bellflower/Downey etc using city buses. My current school in in a nice area of Orange County. We are 50% Asian and a healthy mix of SES. 30% of our students should be attending other HSs in our district and another 30% should be at other HSs outside our district. What is interesting is that at BOTH Mayfair and my current school there is an element that thinks that those outside students didn’t belong. That anything wrong at our school was because of those outside students and yet those students were our most active as creating a community because they not only wanted to be there, but they spent time and money leaving home early and taking the bus or car pooling to our school. While it made their old school “poorer” in some regards it definitely helped THOSE students by giving them a home of their choosing. I moved out of my parents house at 18. Yes I could have stayed at home and tried to make it better for my younger siblings, but sometimes you just have to take care of yourself and if that’s an option you take it. To me choice is always good unless it directly hurts another human being. In this case it doesn’t because those people also have A choice. As renters in Vancouver we’ve had homes sold out from under us or been renovicted a few times and after 5 moves in eight years we decided it would be better for our children if we chose a school close to my (hopefully) stable job. So it wasn’t about our neighbourhood school being a poorer than the cross-boundary school we ended up at, it was just that there is little security of tenure for renters in this city. I know my intention with our daughters was to enroll them in our neighbourhood school. Then our eldest decided at theage of 4 that she wanted to go to French Immersion. Making the decision to put her name in the lottery was hard. Each day we drive past our neighbourhood school where the girls play on the weekend, past the children her age on th block to her FI school. I’ll admit her school is wonderful, the teachers send their own children there (always a good sign), it is small and has an incredibly diverse population. But I do feel guilty that we are adding to a larger problem. As teachers, we have seen what happens to school communities when there are dual track programs where one is considers to be more elite and how it divides the students, parents and teachers. I personally believe that schools should be at the hub of a community. They should be seen by all members of the community as theirs, similar to a community centre. I love it when I see schools that have pre-school programs, ELL programs for parents, night school or anything else that encourages all members of a community to walk through the school doors. If that was happening everywhere then maybe the disconnect that can happen with choice schools would be diminished. That being said, there are many benefits to being able to offer students choice and the opportunity to learn in a setting that supports their specific learning needs. However, I don’t think that the current approach works as it pits schools and districts against one another as they compete for resources, students and money. I think this limits the opportunity for innovation and collaboration.